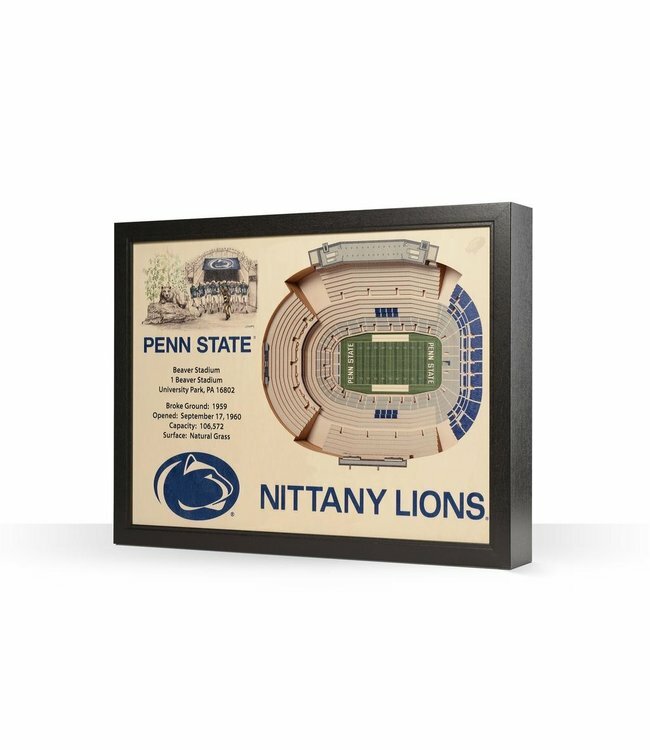 The Penn State Nittany Lions StadiumView Wall Art 3-Dimensional Stadium Replica of Beaver Stadium is hand crafted in the USA from white birch or poplar wood. The Penn State Nittany Lions StadiumView Wall Art 3-Dimensional Stadium Replica of Beaver Stadium is hand crafted in the USA from white birch or poplar wood. StadiumViews three dimensional wall art reproductions feature hand drawn original artwork and stadium facts and features. These heirloom quality works of layered wooden wall art are three inches deep and are finished with a dark brown wood composite frame that includes hardware for hanging. A superb gift for the devoted Penn State Nittany Lions fan that truly inspires admiration. The best stadium view is a Stadium View !